Ever heard the excuse, "The dog ate my homework"? Some of us may have actually used that line at one point or another in an attempt to get out of doing our homework in school. Well, folks, it looks like we got the saying wrong. Dogs apparently don't like homework, but they sure do like tickets to the Masters. The photo you see to your right would be one of Russ Berkman's four tickets to Wednesday's Masters practice round. The Seattle resident hit the jackpot and was all set to enjoy some time golfing and hanging out with a couple of buddies before heading to Augusta to take in the course and the Par 3 Contest. It sounded like a perfect plan ... until Berkman came home to find his dog, Sierra, had eaten all four of his tickets. I guess his dog didn't appreciate being left out of the trip. As Berkman told sports radio station KJR in Seattle, he was at a loss for words when he came home to find the strings from the tickets — and only the strings — lying on the floor. But the story gets better. Instead of cleaning up the mess, the guy went through the puke, piecing the tickets back together in an attempt to keep to the trip on track. That's what you call dedication. With the pieces of the tickets and photographic evidence, Berkman made the call to see if Augusta would consider giving him new passes. Thankfully, tournament officials had a sense of humor and made it easy on Berkman, reissuing him four new tickets. 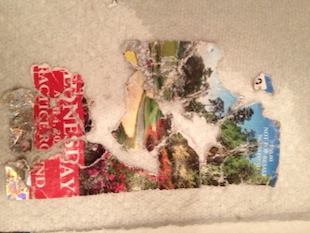 If you take only one thing away from this story, make sure you never leave your Masters tickets in a spot where the family dog has access to them. Doing so could leave you with a real headache ... and lots of puke. Have any crazy or hilarious Masters stories, tips? Be sure and hit us up on Twitter and your story may run on the site.